Embrace a new style with this wonderful Black Glass Console Table. Not only does this black glass table present itself with bags of character it also comes with four drawers with chrome handles that have gorgeous detailing on them, so it is functional too. This Black Glass Console Table is built to have maximum durability to withstand the elements that come with today's modern way of living. It is both reliable and beautiful, it could work with any interior decor you may already have in place, and it brings simplicity and a stylish impression on any space. 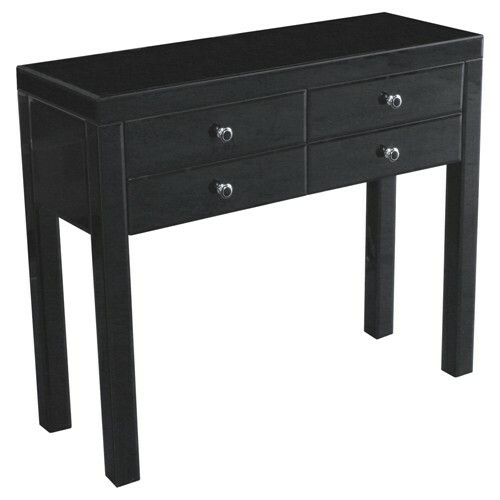 Ideal for use as a sideboard in the living room to display your photos or ornaments along with the added storage, but the versatility of this style means it could be used as a dressing table in the bedroom or a even placed in your hall as a console table to astound all those who walk through your door. Console Table arrived within the time frame, well packed and no damage whatsoever. It was simple to assemble and the only problem were the small ferrals that sit behind the drawer knobs, did not sit flush with the drawer front a bit gentle drilling cured this. All in all an Excellent Purchase and Dooley's Furniture a recommended company to do business with. A 5* star Transaction.